Ralph Court Gardens01885 483225work GardenCome along to Ralph Court Gardens and enjoy our 12 amazing gardens. Set in the grounds of a gothic rectory, you can be transported around the world from Italy to Africa. Enter into our fantasy world! The Ralph Court Gardens are wheel chair friendly and all areas are accessible. Whether you are an adult, a child or a child at heart, you’ll be mesmerised and surprised around every corner of the 3 acre garden. Don your pith helmet to start your journey through the African jungle, taking the tree top walkway. Walk behind the water cascade and enjoy the lush tropical planting. Visit the incredible Triton Pool with its water jets but beware of the rising water. Pass through the Pirate garden with its run aground galleon. Stroll through the beautiful Italian Piazza incorporating a church and bell tower with pencil cupressus conifers under-planted with fragrant lavender. 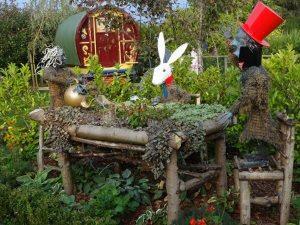 ‘Poop-poop’ past Toad Hall in the Willow garden before losing your way in the Gunnera maze. When you find your way out, make sure you tip toe past ‘Edwina’ our resident dragon! Take a seat in the tranquil Japanese garden with tea house and trickling tree waterlily pool. After experiencing all these wonders of our world, why not take a rest and enjoy a light meal or a scrumptious home made cake in our Phileas Fogg Tea Room. With seating for 80 guests you can enjoy the fine weather and views of the gardens and Malvern Hills from our great outdoor seating patio. Large car park, tea room and disabled facilities available. Within the Alice in Wonderland garden. The garden also boasts a croquet lawn complete with flamingos and a smoking caterpillar. The garden is filled with roses which are separated in box hedges. Come along to Ralph Court Gardens and enjoy our 12 amazing gardens. Set in the grounds of a gothic rectory, you can be transported around the world from Italy to Africa. Enter into our fantasy world! Ralph Court Gardens is on the B4214 between Bromyard and Tenbury Wells approximately 2 miles from Bromyard. Take the turning for Edwyn Ralph Church and we are the 1st on the right.